Pregnancy can be blamed for many odd food cravings. Let me clarify first, please – I am not pregnant (I’m talking to you, Mum). We are perfectly content with our two boys and are determined not to let our kids outnumber us. When I was pregnant – several years ago – I went through a period of insatiable longing for an unlikely food combination. Doritos and pink grapefruit juice. Not just Doritos, not just pink grapefruit juice. They had to be consumed in the same sitting. Thinking of that now makes me feel like a foie gras goose after its daily force-feeding. Thankfully, pink grapefruits and I have developed a much healthier relationship and I typically get my fill of the citrus fruit at breakfast a few times each week. My youngest son and I each take half of the fruit, sprinkle it with a little sugar, and scoop out the sections. The most anticipated treat, however, is squeezing out every last drop of the juice into our bowls and spooning it into our eager mouths. As for Doritos. Well, we have had a little falling out, mostly due to the fact that they were sabotaging my attempts to fit into my skinny jeans. Of course, eating three slices of glazed quick breads has nothing to do with those failed attempts. This quick bread – okay, cake – follows the same formula as my Glazed Lemon & Dried Cherry Quick Bread. In this case, the lemon zest and juice are replaced with the juices and zest of pink grapefruits. While the taste is reminiscent of a lemon bread, it has a slight sweetness that clearly comes from fruit rather than just sugar. Served with a cup of tea or coffee, it works beautifully as an afternoon treat, dessert, or brunch offering. Preheat oven to 325 degrees F. Grease a 8 1/2- by 4 1/2-inch loaf pan with butter or cooking spray. In the bowl of a stand mixer (or a large bowl, using a hand mixer) set on a medium speed, beat together butter, sugar and grapefruit zest until light and fluffy, 4 to 5 minutes. Add eggs, one at a time, beating to combine after each addition. 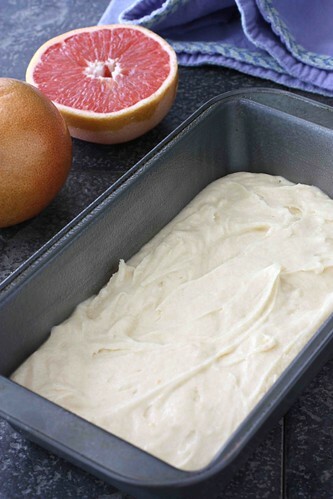 Turn the mixer to low and gradually add the flour mixture, milk and grapefruit juice. Beat until just combined. Take care not to overbeat or the bread will be tough. Pour the batter into prepared pan and level with a spatula. Bake until a toothpick inserted in the center comes out with only a few crumbs attached, 50 to 60 minutes. Let the bread sit in the pan for 10 minutes. Run a knife around the outside and turn the pan upside down to release the bread. Let cool on a wire rack for 1 hour, then glaze. In a medium bowl, whisk together powdered sugar, grapefruit juice and zest, and salt until combined. Drizzle over cooled quick bread. Preheat oven to 325 degrees F. Grease a 8½- by 4½-inch loaf pan with butter or cooking spray. In a medium bowl, whisk together flour, baking powder and salt. In the bowl of a stand mixer (or a large bowl, using a hand mixer) set on a medium speed, beat together butter, sugar and grapefruit zest until light and fluffy, 4 to 5 minutes. Add eggs, one at a time, beating to combine after each addition. Turn the mixer to low and gradually add the flour mixture, milk and grapefruit juice. Beat until just combined. Take care not to overbeat or the bread will be tough. Pour the batter into prepared pan and level with a spatula. I've never been pregnant so I cannot comment on that..lol… but this bread would work in any situation I am sure. It looks delicious! What a unique idea! This sounds so tasty!! i love the flavor combination…seriously, so good! I never had pregnancy cravings like that. I craved bowls of cereal and Snickers ice cream bars (not at the same time). This quick bread sounds so delicious! I love grapefruit. Yummy! Oh boy pregnancy cravings are a funny thing aren't they?! I had to have a bowl of Cinnamon Toast Crunch Cereal every morning or it wasn't pretty around my house, lol! Love it and love this gorgeous bread recipe! Looks delicious! The grapefruit makes it so unusual too! Very clever. I love the use of grapefruit instead of lemon! Yea!! I have grapefruits in my fridge. Guess I know what I'm making for my breakfast tomorrow!! Thanks for the inspiration! Looks great! I love grapefruit so I'll have to try this! What a terrific idea! I was just discussing with a friend about my cravings for acidic foods when I was pregnant. It never occurred to me to replace lemons with grapefruit in something like this but I love the sound of it. Btw – we enjoyed your turkey cannelloni last night for dinner! least you didn't want to decorate with doritos 🙂 looks wonderful, haven't tried grapefruit zest, on the to do list. I'm sure your mom just did a "Oh! Oh." What an interesting combination…Doritos? This quickbread looks so moist and flavorful. What a wonderful flavor the grapefruit must give to this luscious cake! I've never baked with it before but your recipe makes me want to try! 🙂 Thanks for sharing. This bread looks beautiful, and so unique! I've never used grapefruit in baking before. This has been added to my must-make list for spring! What a wonderful quick bread. I love the grapefruit flavor. 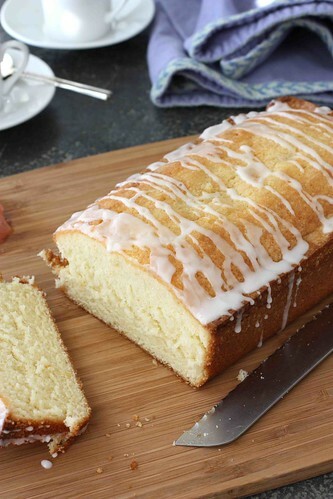 This cake bread looks so soft and moist! 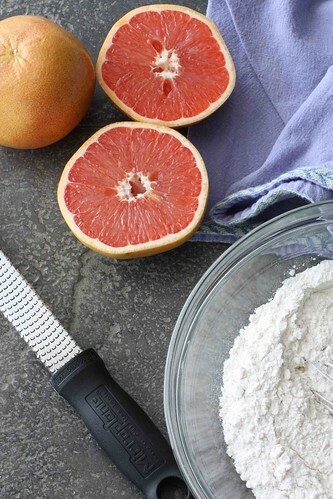 I love the idea of using grapefruit. You rarely see that as a flavor. I can totally get on board with this bread, though. I'm a total pink grapefruit addict (actually, just a citrus addict in general). 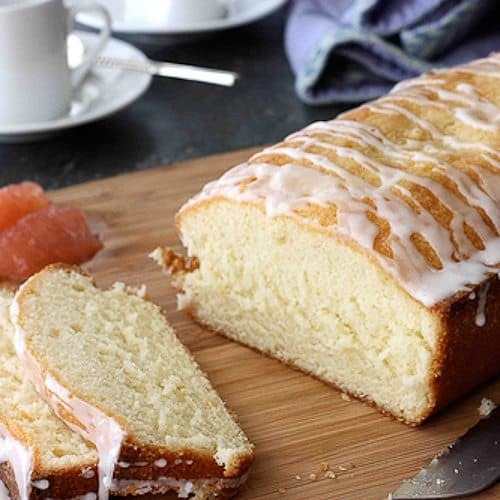 I have made Lemon and Orange breads, but never Grapefruit, i will have to try this one next! 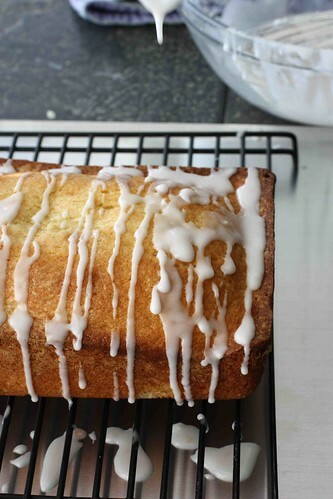 Love citrusy flavor in cakes or quick breads and this is a keeper for sure. mmm looks moist, delicious and exactly like what i'm craving right now. No more wondering what to do with that grapefruit in my fridge! Love the spin on lemon bread! How yummy and refreshing! I totally know what you mean about pregnancy cravings! Crazy hormones! I adore grapefruit too..but I've never tried it with doritos….that may just have to wait till I get pregnant! Thank you for sharing this delicious loaf. I hope you have a beautiful weekend. Thanks for getting mine off to a sweet start! Haven't had to deal with weird pregnancy cravings yet (and it'll be a while lol) – but I already eat enough odd things as it is. I've been seeing a lot of grapefruit recipes lately and really am getting intrigued by them! This quick bread sounds great! Thanks so much, Laura. Let me know how the gluten/dairy-free version works out. I substituted the grapefruit with lemons that I had on hand. I didn’t add the water, but added a little more lemon juice. Also, I separated and beat the egg whites and added them in last. I tried this last weekend and it’s delicious! I didn’t have enough eggs and made it with 1 cup egg substitute and that worked out just fine. 🙂 I only had to increase the baking time. I can’t wait to try this with other citrus fruits! Thank you for the recipe! I’m so glad you enjoyed this recipe. Thanks so much for letting me know. It’s good to hear that the recipe will also work with egg substitute. Just made this last night (thank you pregnancy cravings!!) and it was delicious!! The perfect combination of grapefruit and sweet. I’ve been nibbling (devouring) it all day. I’m so glad you enjoyed it. Thanks for letting me know. I finally tried this bread last night and it was wonderful! Very delicate grapefruit flavour in the bread itself and the glaze really takes it over the top. Even my grapefruit-hating husband loved it. The bread turned out very moist which is sometimes hard to accomplish living in Colorado! I’m so glad you and your husband enjoyed this, Rae. Thanks for letting me know. I was confused by the title above your ingredients, but then realized it must be a typo…left in from the one you copied from before adapting. Thanks so much for catching that, Diane. Indeed, I copied and pasted the basic recipe from one of my other posts and forgot to change the title. Fixed now! 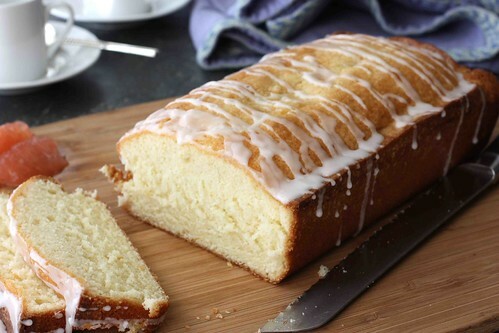 I just made a loaf of this and forgot to put the glaze on, but let me tell how much I LOVE this bread. It is amazing!!!!!!!!!!!!!!!! Couldn’t give it a high enough rating if I tried. Thanks for the weird cravings and awesome recipe! Everything is very open with a precise explanation of the issues. It was definitely informative. Your website is very useful. Many thanks for sharing! Wow. Let me say just how amazing this is! I love anything citrus, especially grapefruits. Since we just bought a whole bag from Costco, I thought this would be perfect to try. I used a stone bread pan, and cooked it just a few extra minutes (5 or 10). It was perfectly done all around, came right out of the pan, was deliciously moist, and the crispy edges were so good I ate all the crust! This is better than any cake, and the recipe cooks up wonderfully. Thank you so much! I wish I had made two at once! Where I live in the coastal Deep South, grapefruits come in at the holidays, and there are hundreds of them everywhere. We couldn’t eat them all, everyone has their own so you can’t really give them away, so I started making marmalade…but there is a limit to all that cooking and it’s not a universal favorite. Beautiful fruit was still going to waste. Then I found this bread recipe, and it has been a total hit the last 2 years! I bake loaves for family get togethers and as work gifts. I freeze them for later in the “winter”. It’s like eating sunshine. Thanks so much! I made this bread today. It was amazing! It is not too sweet and the grapefruit isn’t too overpowering. It is a very subtle bread. Great recipe! I made this cake yesterday. I made 2 big boo boos so I thought I ruined it. I didn’t put the flour mixture into the mixture until everything else was already beaten. (oooops) and then I messed up the glaze by putting 4 tablespoons (instead of 4 teaspoons) of grapefruit juice. Double oooooops). SO, to repair it, I “drenched” the cake in the watery glaze (no, I didn’t have any more powdered sugar to remake it)…. and since the cake was dense, the runny glaze was OUTSTANDING giving it back it’s moister. LOL The taste still was spot-on. Everyone loved it. I didn’t tell them it was a big faux pas. Thanks for the recipe. Ok, I just have to tell you it is not just a pregnant thing… Nacho Doritos and pink grapefruit juice was my go-to study snack in college, with the addition of peanuts M&Ms to round it out.